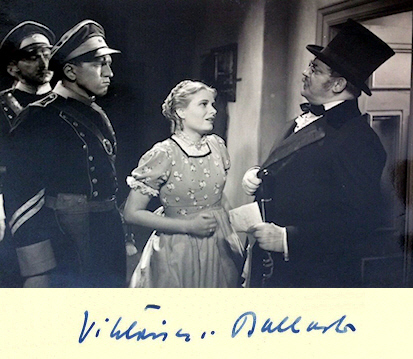 The actress Viktoria von Ballasko was a successful actress from the middle of the 30's to the end of war and took part in well-known German productions. She made her film debut in Luis Trenker's movie "Der Kaiser von Kalifornien" (36). In the next years she impersonated roles in "Kinderarzt Dr. Engel" (36), "Ball im Metropol" (37), "Robert Koch, der Bekämpfer des Todes" (39) and "Kennwort Machin" (39). In the 40's she appeared among others in "Krambambuli" (40), "Im Schatten des Berges" (40), "Das Mädchen von Fanö" (41) and "Der Majoratsherr" (44). She wasn't able to go on from her earlier successes after the war. It followed only few more engagements for "Unser täglich Brot" (49), "Die Schuld des Dr. Homma" (51) and "Liebeskrieg nach Noten" (53). With the movie "Die Halbstarken" (56) Viktoria von Ballasko ended her film career with the role of the mother of Horst Buchholz. But the film meant the begin of a great film career for two young actors - Horst Buchholz and Karin Baal.